This year started out as my busiest fall in the 24 years I have been a special education teacher. Five of the six Re-evaluations in progress. These allowed me to see quickly what was in each folder. Six of my 10 students required three-year re-evaluations before Thanksgiving. That was six within the first 90 days of the school year! When I complained to my special education supervisor about all the ESER due so quickly, she simply said that she had no fear I’d get it done. I rarely missed deadlines, and when I did, there was usually something out of my control that caused this. This fall would be no different. So, how did I manage it? Check-lists for both Evaluation Summary and Eligibility Reports (ESER), and Annual Individual Education Program (IEP). This is the first district I worked at that didn’t have these check-lists, so I had to create my own. If your district has checklists, use them, or modify them to meet your needs and work style. If your district doesn’t provide you with checklists to help you keep current, you will need to make your own. Both lists have before, during and after sections. I have lists started in my TpT store, Special Education Communication & Check Lists, they are fully editable. Unless you have the same process, you will have to edit them to meet your needs. The cost is under $2, and I've been told they were lifesavers to those in my district. Others have reported they were great at helping them start their own checklists. As I worked on either ESER or IEP's I wrote notes on the various cover letter/checklists. It wasn't easy, it was a lot of work. One student changed schools less than a week after our planning meeting; we worked with that school as best as we could. I had one meeting that ended up being late, and it was due to parents not attending a meeting and we had to reschedule. During the first 13 weeks of school, I had meetings on 10 of them! One day, I had three hours of meetings. I couldn't have done it without being organized, without an amazing team of other special education professionals! The 8th IEP of the year; only one more to go! Turned over to our records department minutes after the meeting! This was the first year I had 6 re-evaluations due in such a short time. I couldn't have done it without my checklists! Teaching, Observations, and no knitting! This week marked two months back in the classroom, as well as my first formal observation as a non-tenured teacher. After the hell I went through with my last principal and receiving my first poor evaluation in 21 years, which I believe was his retaliation for calling in the union on him, it is understandable that I was a little nervous. Discuss the book, specifically what's tattling vs. reporting, and place pictures on an anchor chart. How many transitions was that!? As we were lining up for our walk, one student refused to leave the classroom, "Students are earning bonus points during our morning walk, you can't earn them here, I hope you choose to join your class." and the class left -- student decided to join us on our walk. While waiting outside the bathroom, some of them wiggled and wobbled and chatted. "Remember, bonus points are being awarded to students who are showing us appropriate hall behavior: calm bodies, hands, and feet to selves, zero voice level." After returning to the classroom, during our Calendar/Morning Meeting, I had one student who refused to join us on the carpet, and another who kept leaving and returning to the group on the carpet. One of these students spilled milk on herself/himself and was removed from the class to change clothes. Our team continued doing what it is we do every day, with me trying not ignore the fact I was being watched the entire time by our principal. At the end of the day, our principal came in and stated she wanted to talk to all of us before we left for the weekend. She stated we were the most well-oiled team she had ever seen in a classroom. That we were all positive, we gave the same message, when there were other issues, the TA's handled it seamlessly without interrupting the lesson. That the TA's supported me so well that I was free to do what I needed to do, which was teach the students! I think my observation went well! I hope you all had a enjoyable Thanksgiving. We had my family over. Mr. FiberJewels got a Traeger Wood Stove so we had a "turkey cook off" of sort. I tossed the 25 pound Butterball turkey in the oven. Popped fresh thyme and rosemary in the cavity, sprayed it down with olive oil and basted it once it started to get a lovely brown. His turkey required more prep - under the skin he put about 1/4 inch of a mix of butter, garlic cloves, fresh rosemary & thyme, salt and pepper. The reviews from the family is that both were great and no one had a favorite between the plane oven roasted and the wood oven roasted. Yesterday, after post-Thanksgiving clean up of the kitchen, we took a trip to urgent care -- I'm fighting a sinus infection, but as I have no fever, they will not give me antibiotics, but I did manage to get drugs to help me deal with the symptoms. Early in the morning, I fell into the rabbit hole that we call Pinterest! I was looking for information about Daily 5, and ended up stumbling on Planbook.com. 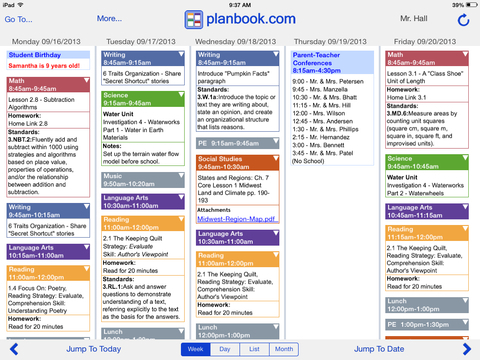 Planbook.com is an online planner, you can access it from any computer, I believe there are also apps for smart phones and tablets (but I haven't researched that). I have been struggling with lesson plans. We are a new team, and one of my Teaching Assistants (TA's) is very new and YOUNG. I think the best way to explain this TA is that she has the attitudes of her generation. In a word, she's a millennial! She needs a lot of guidance and positive reinforcement and I'm finding I have to have EVERYTHING written out for her. Recommendations to her are frequently met with her telling me why she does it a different way. So, in addition to writing lesson plans for the students, I need to write expectations of the adults in my room. This is not something I've had to deal with as I've been lucky, and the TA's I've had are my age with a wealth of knowledge. I was using a word document. When I worked on it at home, I'd save and email a copy to work. At work, I'd save and send a copy to me at home. I had several copies with the same name, and it was getting cumbersome. Additionally, I have to hand in my lesson plans at the end of the school year. While at the bottom of a rabbit hole, I learned how one teacher was using Planbook.com. A quick search on youtube lead me to this video, Planbook.com Walkthrough ~ Teacher Organization Tool, and set up my own account. I spent most of the day yesterday setting up my schedule, adding notes I want to stay with the various lesson times in my own Planbook.com account. The vlogger also has a part two video, Planbook.com Additional Features ~ Teacher Organizational Tool. In the videos, she shared a discount code for a free six months! So check them out and grab the discount code and explore Planbook.com! Today? I'll be leaving for school shortly - I have an IEP meeting Tuesday that I am NOT ready for (have to write the IEP and to do so, I have to be on a school computer, on the school network). I'll also finish up this week's lesson plans! I hope to finish my LazyKaty Shawl tomorrow; I have a row or two to complete. The "bind off" will be crocheted. Pictures to come. Edited to add: Planbook.com keeps getting better. At school right now working on an IEP for a student. Feeling very rusty after 18 months away from school. Can pull up my state's standards and am using them for goals and objectives!